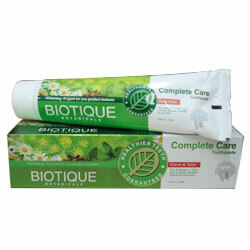 Buy Biotique Complete Care Toothpaste - Whiten, Clean, Removes Stains, Freshen Breath, Control Tartar, Fights Cavities, Brighten Your Smile. 100% pure & natural ayurvedic treatment for your teeth. This toothpaste is 100% pure & natural ayurvedic treatment for your teeth. Healthier Teeth Guaranteed. Gold is the symbol of wealth, but it is also the symbol of health. Let it begin with natures goodness and the wisdom of ayurvedic medicine. Each formula is endowed, to reclaim radiance, plus 9 good-to-you product features for targeted results and the glow of health well-being. Apply to clean, wet toothbrush and brush teeth thoroughly, particularly after each meal or at least twice a day. Rinse well. Do not swallow. Supervise children under the age of 6 years.